Welcome to Something About Coins. Silver seems to be the focus of most of the current coin news circulating the internet. 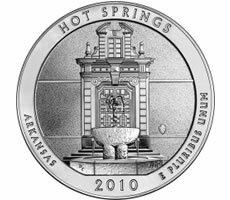 A couple of new releases hit the market this week, including the Hot Springs Five Ounce Silver Uncirculated Coin, the Gettysburg Five Ounce Silver Bullion Coin, and the Glacier Five Ounce Silver Bullion Coin. Silver coin values have skyrocketed, and many coin articles are covering the story. Even the Numismatic Guaranty Corporation (NGC) is getting into spirit by offering a special on-site grading tier for silver dollars at their booth for the Central States Numismatic Society's 72nd Anniversary Convention happening this week. Enjoy!